Dickerson joined “CBS This Morning” in January 2018. Prior to that, he was CBS News’ chief Washington correspondent and anchor of “Face The Nation.” Dickerson is also a contributor to Slate’s “Political Gabfest” and a contributing editor to The Atlantic. Dickerson joined CBS News in April 2009 as an analyst and contributor. For the last six years he has been the network’s political director and has been moderator of “Face the Nation” since June 2015. 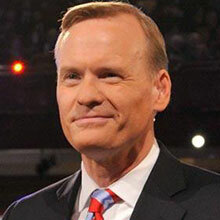 During the 2016 presidential campaign he moderated CBS News’ two presidential debates and as host of “Face the Nation,” interviewed each of the major candidates multiple times. Dickerson has been a reporter in Washington since 1995, covering the White House, Congress and economics. From 2005 to 2015, he was Slate Magazine’s Chief Political Correspondent. A 2010 long-form series on risk profiled current Secretary of Defense James Mattis. Before Slate, Dickerson covered politics for 12 years for Time magazine. During his last four years, he was the magazine’s White House correspondent, covering the presidency of George W. Bush. He has covered the last six presidential campaigns and hosts a twice-monthly podcast, “Whistlestop,” which chronicles great moments in presidential history.